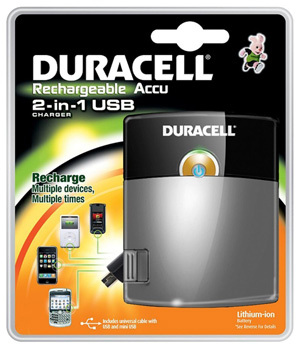 Home > News > Special Offers > Save 1/3rd off all Duracell Device Chargers! Duracell have not long released three brand new device chargers and here at Cell Pack Solutions, we realise you don’t want to pay excessively to charge your devices on the go so for a limited time only we are offering 1/3rd off all three of these devices, so why don’t you read the specifications below and see which of the three Duracell device chargers is right for you! 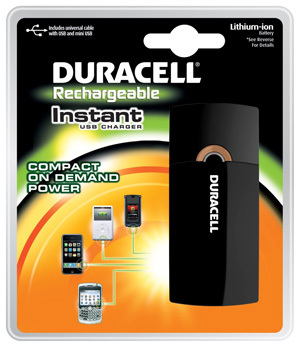 The Duracell Instant Charger is a revised version of a previous Duracell device charger and has been re-designed to provide you with lightning speed instant charging for your mobile devices. Take a more in depth look at the features of this product and see just how handy it can be! The USB out port means that this device can charge things other than devices compatible with mini-USB, with the manufacturer’s cable, such as an Apple iPod. An outstanding capacity of 2000mAh! Be quick to grab a bargain on these chargers while the offer lasts. Prices start from just £15.05 inc VAT! 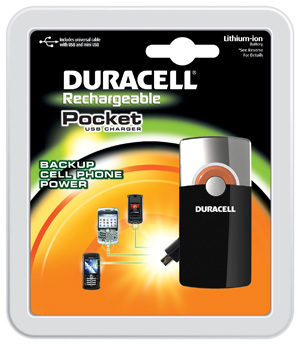 If it’s not a device charger you are looking for, you can check out our fantastic range of our Duracell Standard Battery Chargers Range on our Online Shop.